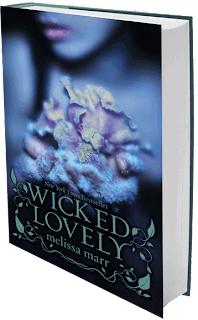 Wickely Lovely by Melissa Marr is a young adult fantasy novel about the Faerie Court and a teenage high school girl named Aislinn. It is set in modern times and start from the last time the Summer King, Keenan, found a mortal girl who just might be the Summer Queen. The synopsis at the back of the Wicked Lovely book was also very intriguing. The book has several things going for it - good world-building, a very nice plot, sympathetic characters and nasty villains that you love to hate. The best part of it for me was the Faerie Court, Keenan, Seth and Donia. Although the main character is Aislinn, I found her to be rather boring. At least Seth has hobbies like music and tattoos plus he can actually do useful things like cooking, research and money management. It's mentioned that he lives alone and is good with his personal finances. Nonetheless, despite all that Aislinn is still properly modern and independent. I loved how she is so active in the plot and doesn't do anything foolish. It's so completely refreshing when characters act grown up and don't whine, throw tantrums or rush in and mess things up. Overall, Wicked Lovelywas great and I will be reading the other books in the series which are Ink Exchange, Fragile Eternity, Radiant Shadows and Darkest Mercy.